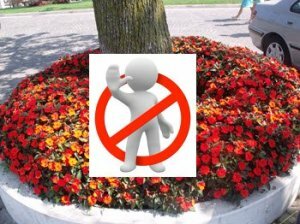 Are Your Flowers Killing Your Trees? Is there danger lurking in your garden bed? There is if that garden surrounds a tree. So many people love the raised look of a garden bed around a tree trunk. While this is a beautiful and appealing way to add color around your tree, it can also be one of the deadliest, because it could be killing the tree that you’ve planting around. It doesn’t matter what you plant inside the bed, or even if you plant nothing at all. The way the soil and other elements in that garden bed block the roots and cover the bottom bark of the tree can slowly make it rot and prevent it from getting the water and nutrients that it needs to flourish and grow. Trees are important, and in your yard they provide a lot for the home and for your family, so it’s important to care for them right. A raised bed might provide a finished look for that tree, but it an also threaten its life. It might not seem like the tree is dying right away, because it won’t. Trees grow slowly, and sadly many of them will die slowly with time. This means that over time, you will notice a change in the tree. Whether you like the look of a raised bed surrounding a tree because you saw it in someone else’s yard, or a professional that you once spoke with recommended it, it is not the best thing to do for that tree. We admit we like the look of the raised flower beds around the bottom of the tree. It hides the roots that might be unsightly, and it provides a center point for the bed, but there are actually many other ways to go about making the tree stand out in a yard that will not kill it. Mulch or soil the areas around the tree without building a box around it. This helps the moisture sit on the specific areas that it is needed, while giving the necessary nutrients and not blocking them. Always leave the ‘flare’ of the trunk exposed, since this is where the tree is going to soak up most of the nutrients. Add compost to the mulch that you use; this helps the tree flourish, while giving it a beautiful finished look. Add a lightweight, low edged border around the tree if you must. Just make sure it is out around the mulch and not too heavy or large to block water flow to the tree. If you like the look of flowers near the base of the tree, use containers. If you want additional tips, tricks or ideas for the trees in your yard and ways you can spruce them up, speak with us here at Architectural Landscape Design. We are your landscape design and installation experts for Minneapolis.